Make sure that loads do not shift during transit with our 6×12 galvanised rope, which comes in this extremely slender 3mm diameter construction. The superb strength goes hand in hand with compelling flexibility and corrosion-countering treatments applied during manufacturing of 3mm 6×12 Galvanised Wire Rope. 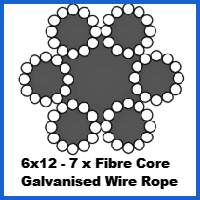 This 6×12 rope helps to demonstrate just how varied our galvanised rope family can be. Each of the bundles which surround the fibre core is effectively its own rope, consisting of 12 galvanised wires wrapped around a separate fibre core to create a high level of flexibility not available from a wire core equivalent. This ability to flex does come at the cost of sturdiness, so while its 376kg capacity is decent, it is not normally a sensible idea to select this rope for lifting operations or any applications involving shock loading. More often than not it will be deployed to lash cargo in place in maritime environments where it can get soaked with sea spray and stay rust-free for years. There are many ways to manipulate the wire rope we stock simply by asking us to adapt it for you. It makes sense to let the Rope Services Direct specialists put together an assembly using 6×12 galvanised rope and save yourself a lot of time and hassle in the process. Get in touch with us using our contact form or by calling the team on 01384 78004 if you are in need of our exceptional rope manufacturing services. 3mm 6x12 Galvanised Wire Rope Overall rating: 5 out of 5 based on 6 reviews.